There are two ways to reach the area of Punta de la Sal, which is the deepest part of the reserve. We normally use the 'Table Top' entry point as this is less prone to the effect of a northerly wind. This is not only a deep dive, but also a long dive, so is only suitable for experienced divers who can demonstrate similar previous experience, as we normally plan this as a decompression dive. We start by following the undersea cliff at a level of 10-15m. In clear conditions this area can hold tuna, barracuda, trumpetfish and grouper. We descend slowly, passing a field of garden eels on our right, till we reach an area of large boulders, in around 20m, where large numbers of morays can usually be found. Continuing on from this point, we reach the 'campo de gorgonia' in 30m where you can see these delicate gorgonians. There is one particular gorgonian which is over 2m wide. In this deeper area other species such as marbled-electric rays, gilt-headed bream and angel shark have also been seen. This PADI 5-Star Dive Resort is the closest dive centre to the fabulous El Cabrón Marine Reserve at Arinaga , the best place to dive on the island of Gran Canaria. The combination of small groups, intimate knowledge of the marine reserve, and a long term stable team of mature instructors means that every diver is treated to a personalised exploration of this treasure-trove of marine life. They are the only dive centre with complete facilities including toilets close to this diving location. 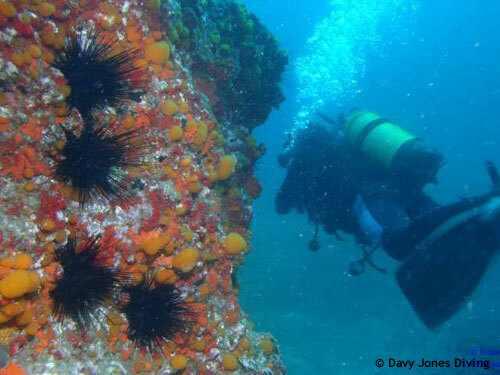 The El Cabrón Marine Reserve at Arinaga on Gran Canaria is one of the ten best dive sites in Spain, and has its own guide book. Dives vary from 6 to 30m and not only is it packed with fish, the variety and bio-diversity have surprised and astounded many visitors. Barracudas, morays, five types of stingray, grunts, trumpetfish, bream, damselfish, parrotfish, wrasse and cephalopods are all found in huge numbers, different seasons can bring stingray, angelshark, blue shark, and many other species into the area. Don't turn your nose up at the fact that this is a shore diving area - all the sealife is packed in close to the shore and the underwater lava scenery is stunning. There are caves to explore with the vivid red Canary Island Lobsterette, and night diving can bring squid, red-legged octopus and golden balearic congers. The Gorgonians near Punta de la Sal is a deep, long dive for the experienced diver. It's a roller coaster ride drop down to 30m where there are Gorgonians of up to 2m wide. Also common to this area are Marbled Electric Ray's which will make your hair standing on end. Other marine life includes Gilt Head Bream and Angel Sharks in the winter months.